Jadore L'Absolu women's perfume by Christian Dior features an exquisite blend of fresh aromas that attracts attention without being too heavy or overpowering. A charming combination of floral notes, including jasmine, rose and tuberose, mingles perfectly with green accents and ylang ylang to create a feminine fragrance that exudes an air of elegance. Introduced in 2007, Jadore L'Absolu is a romantic perfume that can be worn whenever you want to add a little flirty fun to your day. Jadore has been out since 2000! It was the fragrance I had been looking for as I had grown tired of my previous favorites. After finding a sample in a magazine, I knew this was the one to purchase next. It's still my favorite although I enjoy trying others from time to time. I absolutely love Jadore cologne and wood recommend to anyone who wants a cologne that is subtly soft never over powering like some even if you add a little too much. 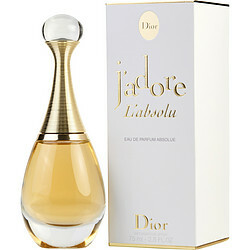 The fragrance lasts the whole day and with a little additional spritz it will go on into the night. There is just nothing I enjoy wearing as much as Jadore. I always get compliments about the scent.